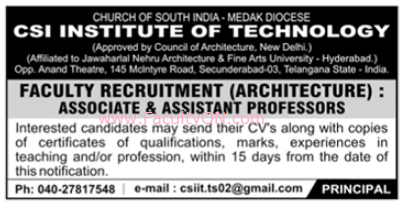 CSI Institute of Technology, Secunderabad has advertised in the DECCAN CHRONICLE newspaper for the recruitment of Teaching Faculty- Associate Professor / Assistant Professor jobs vacancies. Interested and eligible job aspirants are requested to apply within 15 days from 04th October 2018. Check out further more details below. College Profile: CSIIT School of Architecture believes that design is the touchstone to all things. Design education requires a deep and integral understanding of Art, Science & Technology. The faculty at CSIIT are committed to providing students with an experience and a framework that approximates a Renaissance education . . . while simultaneously exploring the modern conditions of our time and place to provide the intellectual ground for the artifacts i.e., writings, drawings, models, and constructions etc. that the students will be making in their coursework. How to Apply: Interested and eligible candidates are requested to send CV along with copies of certificates / mark sheets / experience certificates and recent PP size photographs to the following postal address or email address.